Standing in a room where there is a high-speed wobbling fan can cause shivers to run through your body. A ceiling fan that is not properly fixed is a visual distraction on the one hand and an irritation on the other hand. It also causes damage to the bushings and bearing of the motor. This leads to some annoying whines and squeaks originating from your motor. When your fan is not properly balanced, you don’t need to rush into buying another one before you try balancing it out. In this article, I will share some basic steps, tips, and tricks that can help you get your fan properly working. By following the guide about how to balance a ceiling fan, you should be able to end these annoying wobbles and eliminate the fear of using a ceiling fan. Throughout the balancing process, you need to ensure that the fan is switched off and the power is cut off as well. Balancing a ceiling fan may be as simple as tightening few screws that may have become loose on the blade brackets or even wiping dirt off the blades. Some of the basic tools and materials you will require include ladder, screwdriver, paper towels or damp rags, yardstick or ruler, pennies, superglue, and painter’s tape or masking tape. The more advanced balancing procedures may involve the use of a balancing kit. This kit is easily accessible in home-improvement stores and includes tools like clip and weights. You may also improvise tools in your home that you can use to balance the fan. They include dimes, tapes, and coins. Coins can, for instance, play the same role as the weights. In balancing the fan, you’ll need to begin from the mounting bracket going downwards. You’ll need to check the screws just to make sure that they are not loose before you proceed with the balancing process. 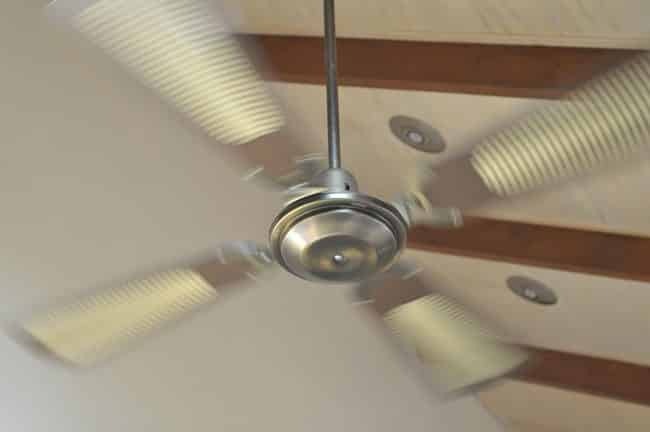 We will go over the steps that you need to take in order to balance an indoor ceiling fan, and I will share some of the tips that will enable you to solve those stubborn balancing issues. The blade bracket screws sometimes get loose and this may be the main cause of imbalance in your fan. The other cause may be the accumulation of dust which tends to put extra weight on one blade over the other. If tightening of the screws and wiping off the dust doesn’t solve your problem, then you need to proceed with rest of the balancing procedure. Before you even begin the balancing process, you need to mark your blades so that throughout the balancing act you are able to keep track of them easily. 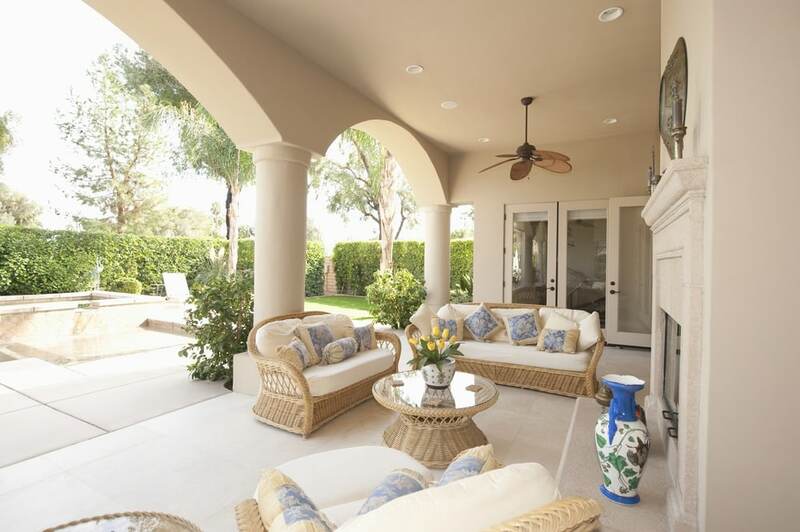 The biggest cause of imbalance in ceiling fans is the build-up of dust. It is quite easy to forget cleaning your fan during the routine cleaning processes. Dust tends to settle on the blades in an uneven manner causing some to become heavier than others. In the first step of balancing, therefore, you need to banish the dust off the blades. If dust has built over time, the chances are that it is now hardened and may require more than a swipe of a duster to get off. You will need to climb the ladder and carry a damp rag alongside to clean both sides of the blades. Have another fresh rag to assist you to dry the blades after removing the dirt. Try spinning the blades to check whether the problem has been fixed. If the fan is still not balanced, the next step is to check the base screws. These screws are located between the flywheel and the blades. Try to give a clockwise turn to each screw using the screwdriver just to ensure that they are properly tightened. If you find any loose screw, then you are likely to solve the issue that has been affecting your fan. After you are done with the tightening, spin the fan to check if the problem has been sorted out. If it hasn’t been fixed, the next step is to check the blade alignment. In this step, you will require a ruler or a yardstick to be able to measure precisely. You will need to take three different measurements between the ceiling and the blades at the same point for each of the blades. The ideal measurement locations are the central location of the fan close to the flywheel, the halfway of the blade along its length, and the tip of the blade. In case there is variance among any of the blades, you will have to slightly bend the blade holder in a gentle manner and straighten it back in a bid to solve the misalignment issues. Just be careful so that you don’t break either the blades or the holder. If by the end of this step the fan hasn’t regained its balance, then you will have to proceed to the next level of balancing. At this level you will require to use a balancing kit. We have already seen the basic steps that you need to take to achieve balance for an indoor ceiling fan unit. In this section, we will share some more steps that will help you address the wobbling issues considering the fact that the basic steps have failed to do so. The first thing you will need to do is to open the canopy cover by loosening its screws. This cover is usually adjusted together with the ceiling. You then need to open the mounting bracket so as to slide down the cover. Having exposed the mounting bracket, the next step involves tightening its screws. The mounting bracket will enable you to see the outlet box whose screws also needs to be tightened. In this step, therefore, you will tighten the screws on both the mounting bracket and the outlet box. The next step will involve checking the down rod. You will need to confirm that the pins and the down rod screws are securely fasten. Ensure you tighten any loose screws and place the pins firmly on the down rod. Having fixed the down rod, the next step involves checking the fan blades. Various components need to be fixed as far as the fan blades are concerned. They include the blades, the motor housing, and blade holders. You will start by fixing the blades on to the blade holders. Once they are in place, you will then proceed to the motor casein order to secure these blade holders. The housing comes with a bracket that needs to be adjusted by gently bending it. The blade holders then need to be pressed up and down to achieve the required adjustment. The next step that comes after securing the blades involves checking the vertical distance. Ensure that each blade has the same distance between the holder and the tip. You will have to measure these distances and correct for any discrepancies by adjusting the holders. Continue doing these corrections until all the blades have the same equal distances on their vertical axis. Having finished these steps, you will then need to switch on the fan and verify if the issue has been solved. If the wobbling hasn’t stopped, it is time to get the balancing kit for the blades. In the next section, I will share some tips for using this kit. First off, it is important to confirm that the main issue that has been affecting your ceiling fan has been resolved. You, therefore, need to go through a set of checklists to facilitate this confirmation. The first thing you need to check is whether or not the fan blades that were tarnished or warped have been replaced. You then need to confirm if the ceiling fan has been cleaned properly so that to rule out any possibility of the dirt causing the wobbling. You then have to check on the screws to ensure that they have all been tightened and that the fan blades have been properly secured with the motor. It is only at this point that you can confidently break your balancing kit to stabilize the fan unit. The kit contains three balancing weight and a plastic clip. Most ceiling fans come with this kit but just in case your unit lacks one, you can as well buy it on the market. With the balancing kit, the first thing you need to do is to observe and understand the fan speeds at which the wobbling mostly occurs. Once you have taken note of the situation, switch off the fan and let it come to a complete stop. The next thing is to ensure that the plastic clip is securely fasten to any of the blade’s edge. The clip needs to be placed half-way between the holder of the blade and the tip of the blade. You then need to switch on the fan and check if there is any refinement. In case you notice no improvements, move the plastic clip across the whole blade to be able to trace where exactly the wobbling occurs. Do this process on all the blades and pinpoint the specific blade that may be causing wobbling issue. The last step involves using the balancing weights to solve the issue. The weight needs to be placed on the faulty blade along its centre line. The weight needs to be pressed to the clip in a parallel way. Balancing a ceiling fan is not a complicated process as long as you understand how to balance a ceiling fan and follow the steps and tips I just shared. If after following the process including using the balancing kit and you notice that the wobbling hasn’t stopped, you will need to do some additional checking just to ensure that everything is in order. The first thing to check is whether the outlet box has the capacity to carry the weight of the fan. Then confirm that the box has been fitted firmly to the ceiling. If everything is fine and the problem is still there, you should call in an expert or better still replace the indoor ceiling fan.